Indeed, the prospect of hearing Blanco, who was selected to read his original poem at President Barack Obama’s 2013 inauguration ceremony, reflect on his life and work, drew such an overwhelming crowd on Monday that the venue needed to be changed, on the spot, from Razzo Hall to Jefferson 320. 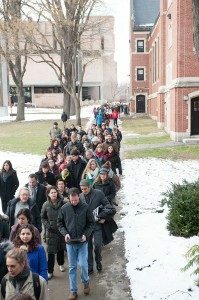 The announcement triggered the “stampede,” which in fact was an orderly, gentle (these were poetry lovers, after all) migration of an estimated 400 people across campus. 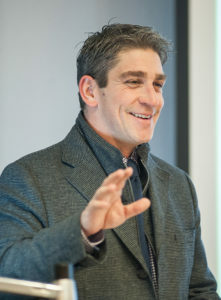 Listen to Richard Blanco read two of his works during his visit to Clark University. From the podium, Blanco offered a thoughtful, poignant and often funny account of a personal journey that, he noted, harkens to Clark’s mission of challenging convention. He cited his seemingly counterintuitive avocations of poet and engineer and his search for identity in the United States as the son of Cuban immigrants as clear examples of his own passage through a sometimes untraditional life. Blanco quipped that he was “made in Cuba, assembled in Spain and imported to the United States” (he was conceived in Cuba, born in Madrid and immigrated to Miami while an infant). “By the time I was forty-five days old I’d belonged to three countries,” he said. Flashing family photos on a large screen, Blanco recited a number of his poems, many ignited by themes of belonging, his relationships with family members and notions of patriotism. His voice, strong and steady, gave an almost musical cadence to his observations, which approached performance art. At times he closed his eyes, needing nothing more than memory and inspiration to deliver the lines on the pages before him. Coming of age in Miami, he said, was “like growing up between two imaginary worlds,” a kind of cultural purgatory for a boy trapped between the Cuban culture of the 1950s and ’60s and shiny American sitcoms like “The Brady Bunch.” Through his poetry he recounted his family’s hesitant attempts to celebrate Thanksgiving (“I uttered a bilingual blessing/and the turkey was passed around/like a game of Russian Roulette”) and their raucous wagering on the Miss America contest. Blanco built his presentation toward a reconstruction of Inauguration Day, Jan. 21, 2013, when he read his poem, “One Today,” before a throng who had come to Washington to watch the president be sworn into office — and millions more who had tuned in to the event. It was an historic occasion. Blanco was the first Latino poet, the first openly gay man, the first immigrant and the youngest person bestowed the honor of addressing the American people in verse at a presidential inauguration. The request from Obama to write the poem had left him dwelling on two serious questions: “Do I love this country?” and “What do I love about this country?” The answer came back to a sense of belonging, something with which he’d long wrestled. In an earlier poem about what it felt like to be uprooted and dislocated, Blanco noted, “Home is a forgotten recipe, a spice we can find nowhere, a taste we can never reproduce exactly.” On Inauguration Day, seconds before approaching the podium, Blanco was struck by a strange calm. He’d found the recipe. “As an immigrant, there’s always a little piece of you that says ‘I’m not American,’” he told the Clark audience. “That America is some place I have not been yet, some town I have not lived in yet. And to be asked to address the entire country, I can’t tell you … [it was] this sense of finally belonging. Blanco’s presentation was followed by a reception at Dana Commons, sponsored by the Officer of Diversity and Inclusion, where he signed copies of his books of poetry, including his latest, “For All of Us, One Today: An Inaugural Poet’s Journey.” Remarks were given by President David Angel and Professor Betsy Huang, chief officer of diversity and inclusion.